UPDATE : The plot thickens as to the closure of this place based on a recent (17/1/18) BBC article. and town would be packed full of places selling seafood and pretty much nothing but seafood. We have zilch down the bay in terms of seafood restaurants (aside from perhaps sashimi at Yakatori 1) and only Fish@85 in Pontcanna in term of what I would regard as a restaurant specialising in seafood (as opposed to ones where seafood is on offer by not the focus of a place – as good as Asador 44 is with their whole turbot and other fish offering, lunch time £10 offer which includes some lovely fish dishes, and those “just wow” carabineros, fish still to my mind plays second fiddle to the glorious meat). 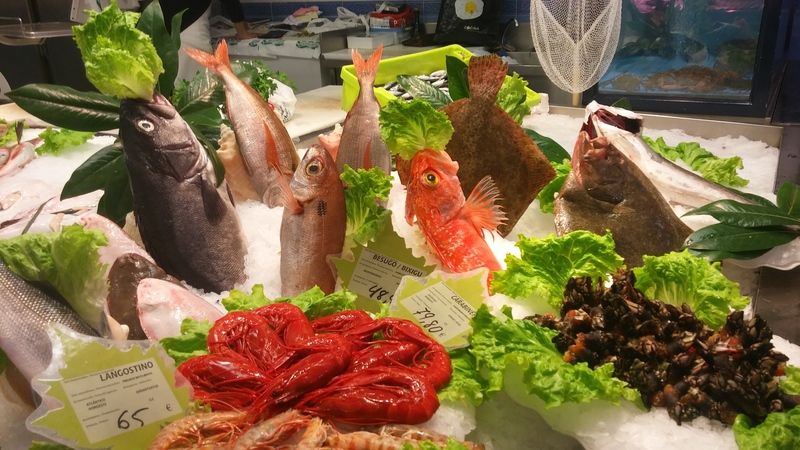 Again if Cardiff was a Spanish city there would be many, many fishmongers (Donostia San Sebastian has over 30 and is less than half the size of cardiff, which had 2!!!!). 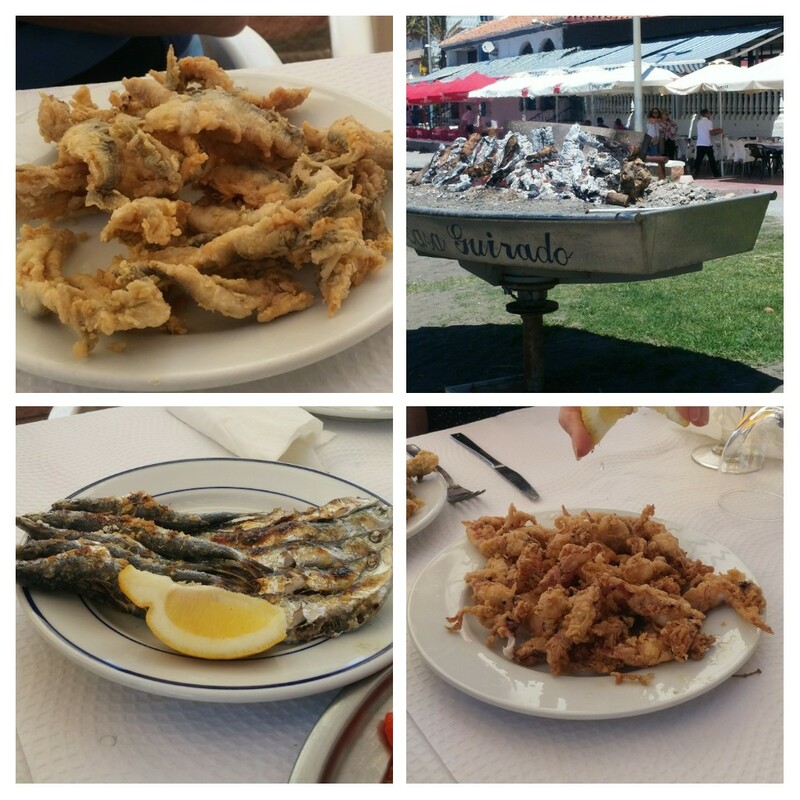 Fish market – Jerez – €8 for a kilo of mantis shrimp!!! I suspect any decent sized city in Spain will have more fishmongers than are in the whole of Wales. As part of a nation with 870 miles of coastline, Cardiff doesn’t seem to love seafood (fish, in particular) as much as perhaps it should and therefore a place, as is the case with the recently opened Seafood Shack, that markets itself under the hashtag #excitedforseafood is either moving into an area where latent demand remains uncatered for and under the radar or has misjudged the market. As a lover of seafood, I hope it is the former and not the latter. 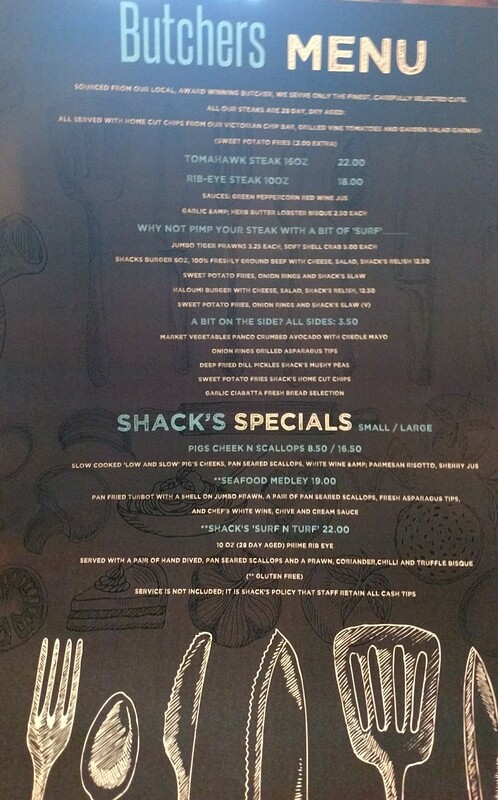 The Seafood Shack does seemed to have hedged their bets somewhat with the hashtag #excitedforseafood, as the menu includes more than a sprinkling of meat. I went (with a mate from work) for lunch with expectations somewhat muted, due to a mixed review of the place, but with an open mind. In fairness, the less than favourable comments in the review pointed to teething problems of a newly opened place bedding down new processes rather than any really fundimental issues and I have waited as while before visiting. The theme, I suppose unsurprisingly, gives at least a nod to the nautical. There is a fine line with this theme between acceptable and “Spongebob Square Pants”. This sits the right side of the line – perhaps a bit “Pirates of the Carribean”. I very much like the fact that with the lobsters they sell they operate a “buy one, set one free” programme with the National Lobster Hatchery. On the original (online) menu, reference was made to the oysters and mussels being from Anglesey and the lobsters from Tenby. These references to local sourcing seems to have been dropped from the in store menu. This is a shame as I am very much in favour of using local produce. Good for the environment and helps local businesses. On chatting with our waitress she stated that the menu we were given (rather than the online one) is pretty much the final version (few typos – I know the feeling all to well – to deal with aside), but also that they will be having a specials board (I am assuming this is in addition to the “Shack’s specials” on the menu) . Hopefully this will operate to reflect the seasonality of seafood and thus have on it locally sourced “in season” seafood. Few things lacking on the menu, I thought. No sewin (local fish which is bang in season in the Summer months), John Dory, halibut, gurnard, brill, mackerel (any seafood place worth its salt should, in my opinion, have mackerel on its menu – one of my favourite fish with the added bonus of being cheap), plaice, sole etc., and also no fruit de la mer, langoustine or clams (razor or otherwise) or (that most Welsh of bivalves) cockles. Hopefully the specials board (as and when it arrives) will inject a bit more adventure and seasonality into the offering (which to me looks a tad staid and by the numbers at present). In addition to the seafood, meat eaters are also catered for with a beef burger, steaks and fried chicken. Veggies seem to get a bit of a raw deal, with only one “small plate” mushroom and cream dish and a halloumi burger (which curiously comes with additional cheese, so doesn’t that make it double cheese burger 😀 – no idea if both are rennet free – halloumi usually is, but the other cheese?). This means if you are a vegan you are pretty much out of luck (can see that winding up a few people). It’s not that cheap with the “larger plate” dishes ranging from £12 up to £18 and a seafood curry is ambitiously priced at £17 (Rick Stein charges £14.95 for his). They also don’t seem to have a lunch time menu or any lunch time offers, which means it is unlikely to be regarded as a regular lunch time haunt (for me and many others I suspect). they may want to rethink the absence of a lunch time deal/menu. What is already out there, in terms of lunch time offers, makes it a very competitive market place and not doing one is likely to lose them trade in my opinion. As there is no lunch menu and not wanting to spend a huge amount on lunch, I went for the “larger plate” cod cheeks (£12). My dining companion, went for the deep fried haddock (£12). 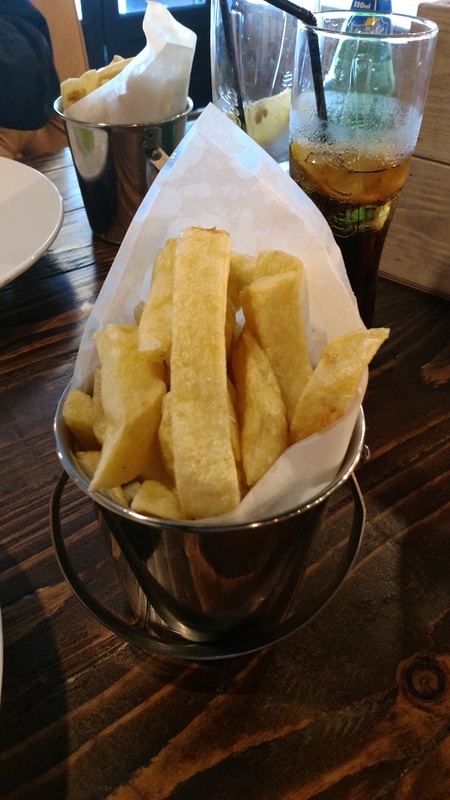 as well as some “chip shop” style chips. 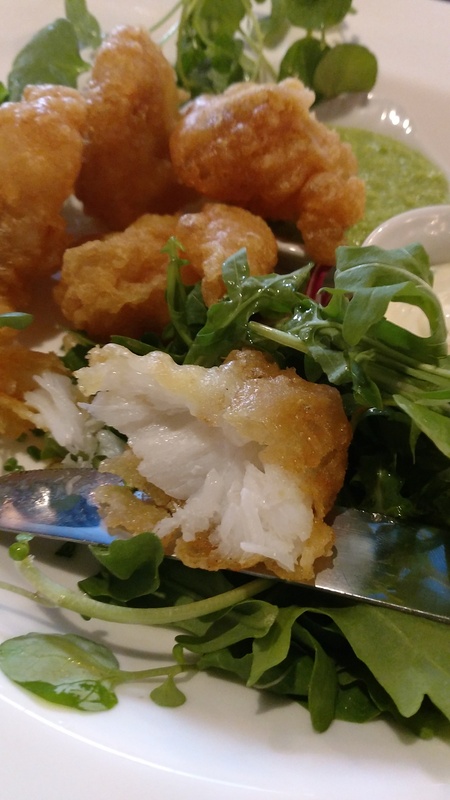 A cod cheek is exactly what it sounds like, a prized nugget of flesh that sits below the eye socket. Don’t tend to see them that often on menus (even with big fish like cod you get very little cheek meat, but it is a very flavoursome bit of the fish and worth looking out for) over here. The batter was excellent, light and crispy and oil free and the cheeks within had been nicely cooked, with a good flavour and texture. Perhaps a rather small portion with four cheeks (they are not big), but very pleasant. 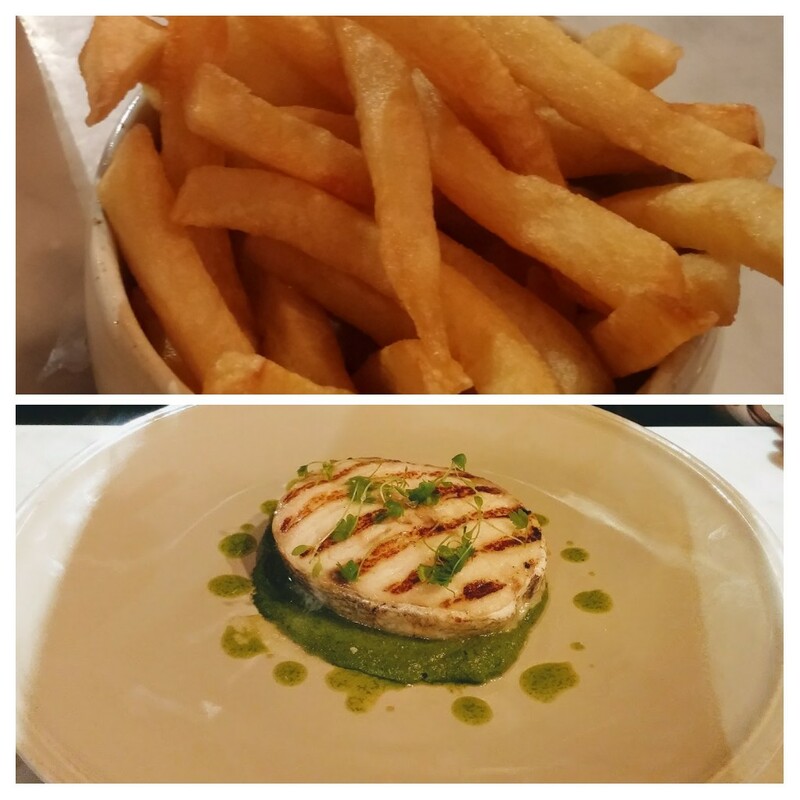 The chips were chip shop style (so not particularly crispy) and were a decent portion. I enjoyed them with my battered cod cheeks, but with the “La Plancha” fish I think I would want the chips a bit more crispy. This brings me to the alleged mushy peas. Firstly it was a very stingy portion, sitting in a shallow condiment saucer (little more than 2 inches across and a quarter inch deep) and secondly they were pureed (frozen I think) garden peas. 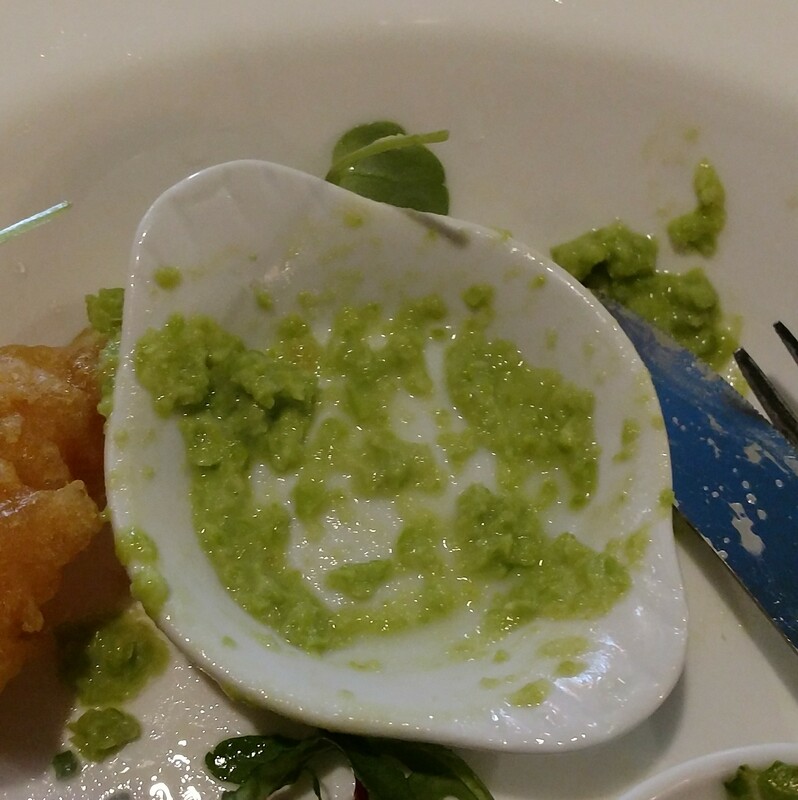 That is not a bowl of mushy peas as far as I’m concerned, which should always be made using marrowfat peas. I note that as a side the “mushy peas” are £3.50. If the portion size is the same that is an awful lot for not very much. Up the cod cheek portion size and either don’t call it mushy peas (what we got was a pea puree) or, better still, make it properly (i.e with marrowfat peas) is my advice. The tartare sauce was also a bit disappointing. It lacked the tartness of a good tartare sauce and seem to me to be just mayo with some chopped gherkins in it and missing the all important caper element. Shame as I love a good (i.e. sharp and tangy) tartare sauce. My friend ordered the haddock, which was a very decent sized piece of fish. Nicely cooked and encased in a light and crispy batter. 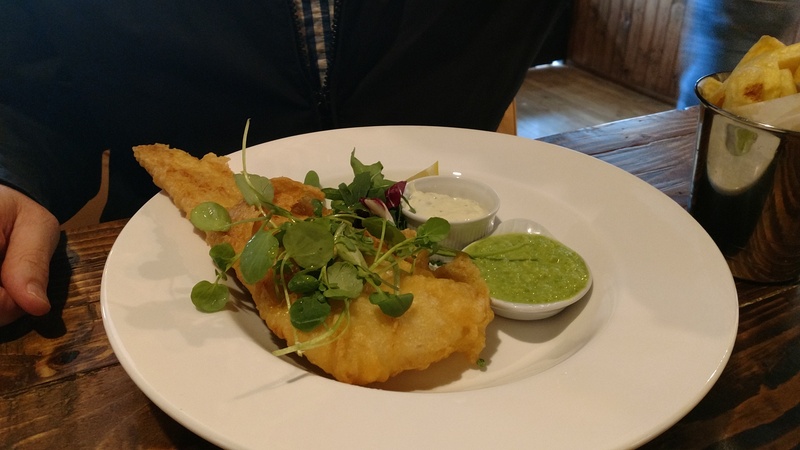 He was quite impressed with his fish, but (as with me) less so the “mushy, not actually mushy” peas and the tartare sauce. 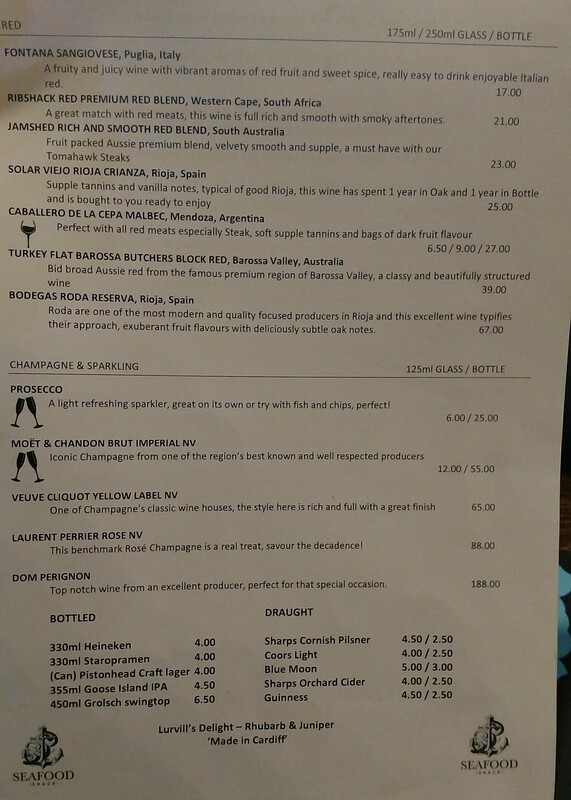 They have an interesting (in a good and a bad way) wine list. On the whites and the rosé front, the pluses are a Picpoul de Pinet and a decent Albarino (both great seafood wines) on the list. The minuses are a ghastly white Zindanfel and the level of their mark ups (especially as there are no vintages details on the list – I don’t like that at all as there can be a big price difference between a good and not so good vintage of a particular wine). On the mark ups (a serious bugbear of mine), the latest (standard rather than wild) Greywacke sauvignon blanc vintage generally retails at between £14 and £16, so the price (if it is the standard one, which the menu description suggests) of £67 on the list here is frankly taking the p##s. The Vionta Albarino is also pricey at £35, as I have seen it on lists elsewhere for £23 and it retail for just under a £10 (also just down the road from this place, at Curado Bar, you can get a perfectly nice Albarino for £18 which puts the price of this one into sharp focus). The Picpoul de Pinet on the list at £23 (generally retails at a tad under £10) is better value. On the reds, the theme of decent stuff but high mark ups continues. 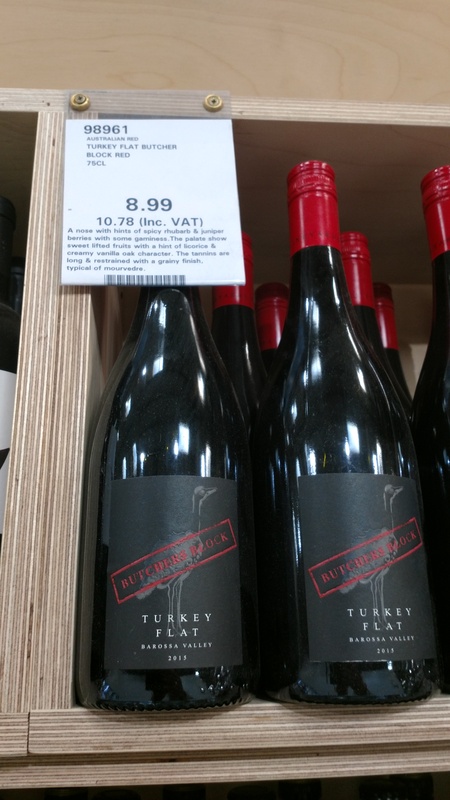 The Turkey Flats Butcher’s Block is a very nice wine but retails in Costco in Cardiff for under £11, so the price of £35 on the list here is high. The Roda on the list is an interesting one, being a modern style Rioja (I have been to the Bodega and they certainly do things differently from the classic Rioja producers) which people either love or loath (Mrs. SF hates it). I assume here the vintage is 2011 (but annoyingly the list doesn’t say), which retails at around £24 – £25 and is on the list here at £67. Pricey, but when you compare it to the Greywacke (retail price £13 – £16), why is the Roda the same price on the list as the Greywacke? Suggests to me some “finger in the air” pricing. It was a working day, so we were on the soft drinks. Nothing re soft drinks on the drinks list (annoying as no info as to price or choice) so we had to ask. Usual suspects as far as I could tell (e.g. fizzy drinks). I had a coke and my friend a sprite. Outrageously the coke (330ml bottle I think) was £3.00 (the sprite £2.50). I moan about wine marks up, but those on soft drinks are often even worse. 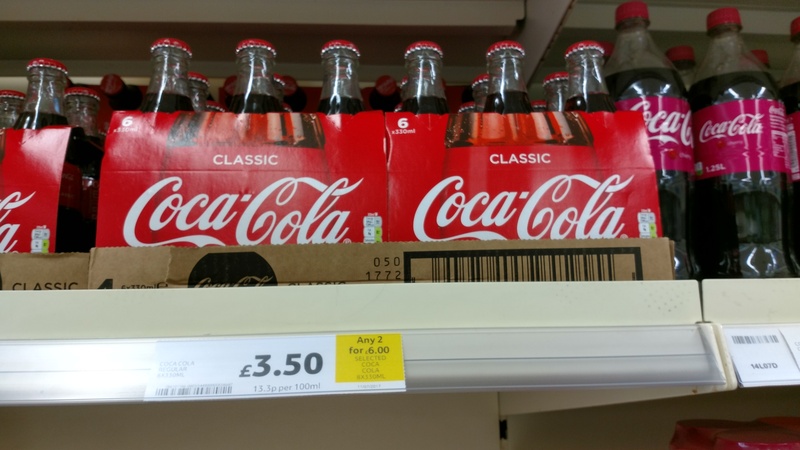 Talking the price of a coke here being 6 x the retail price. Why are non alcohol drinkers so often penalised in restaurant, if they drink anything other than tap water (if I had known the coke was £3 that is precisely what I would have done)? I enjoyed my lunch at the Seafood Shack. My cod cheeks were very pleasant, as was my fellow diner’s haddock. 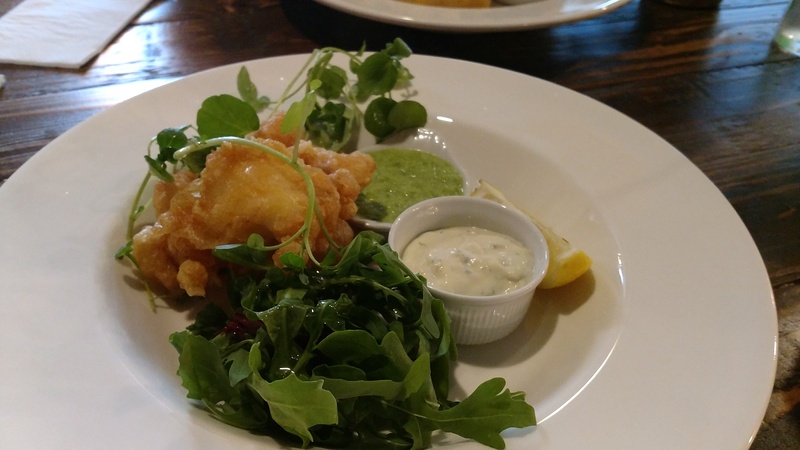 The fish and batter were good, less so the mushy peas and tartare sauce. The shortened menu, however, looks to me to be a bit of a missed opportunity in terms of bringing what I regard as a top notch fish restaurant to the City centre. 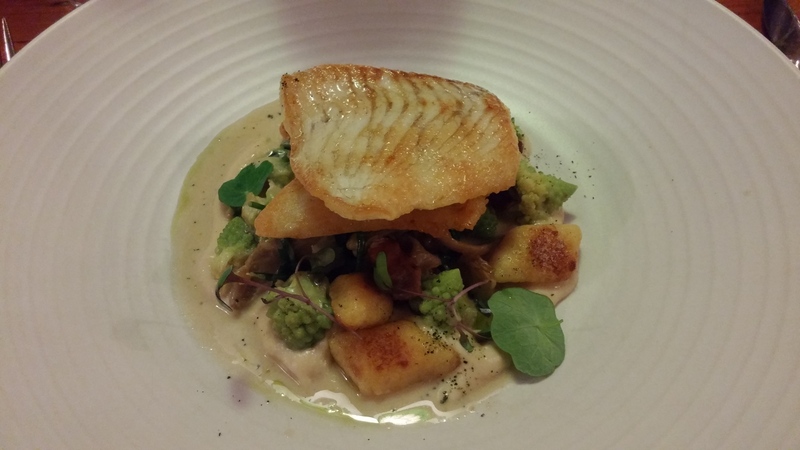 I didn’t expect a über swanky Nathan Outlaw type place, but was hoping for somewhere that did fish dishes a bit more like the brill I ate at Kota in Cornwall. There doesn’t seem to be much stuff like this on the menu here. It is intending to operate as a chain, so perhaps my expectations were/are unrealistically high. I do, however, hope the promised specials board will up the ante a bit more. 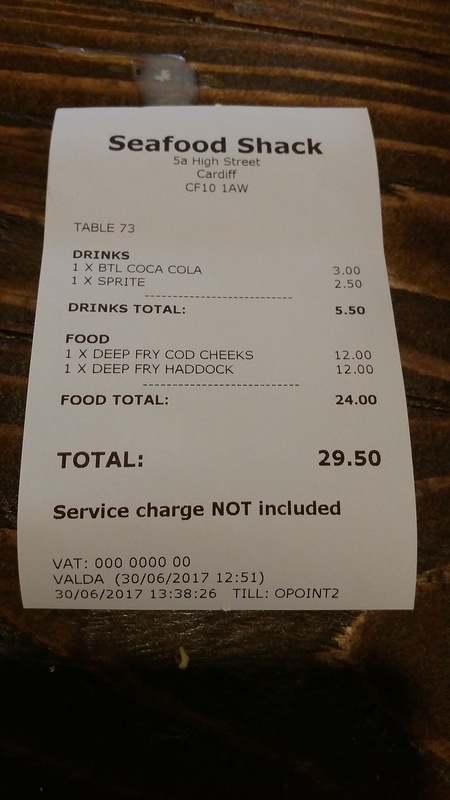 We paid, for two, just shy of £30 for one course each, with soft drinks. It was nice, but not cheap especially for lunch. Drinks, in particular, are pricey. 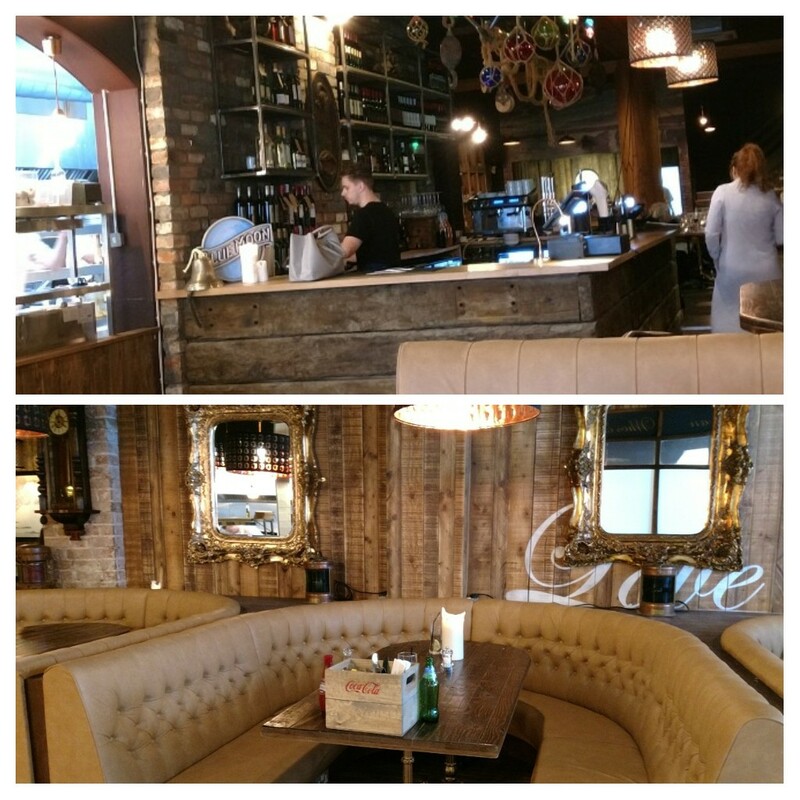 Service was good – our waitress was very pleasant and informative about the food on offer. Would I go back? Yes as I enjoyed the food, but probably in the evening rather than at lunchtime with the hope of more from the promised “specials board”. If they want to attract the lunchtime crowd (inc. me) I think they need some lunch time specials/a dedicated lunch time menu (if Asador 44 can do it, I see no reason why this lot can’t). Drinks are expensive, with in many instances wine and soft drink mark ups being unjustifiably high in my opinion. Address: 5A High Street, Cardiff, CF10 1AW. I completely agree with you on the mackerel front – it’s a current darling of the restaurant world but I have been attempting to cook it more at home because it’s so reasonably priced, fairly sustainable and doesn’t take much to cook under the grill! 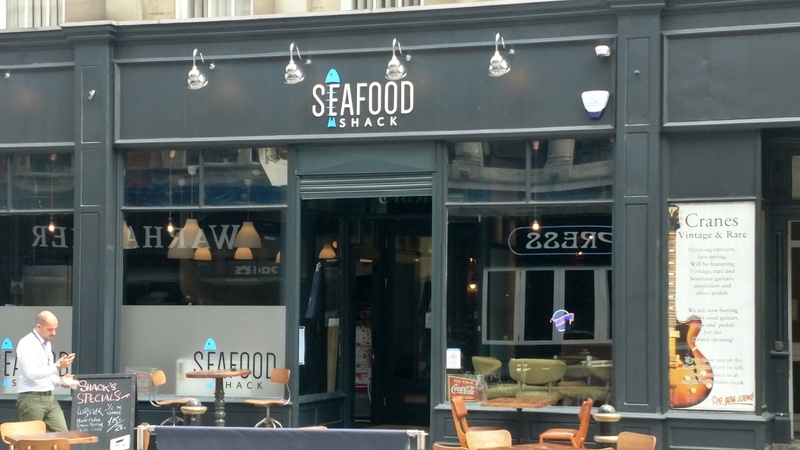 I can’t believe there’s such a lack of seafood places in Cardiff – hopefully this place expands its offering to fill what must be such a void in the market?! 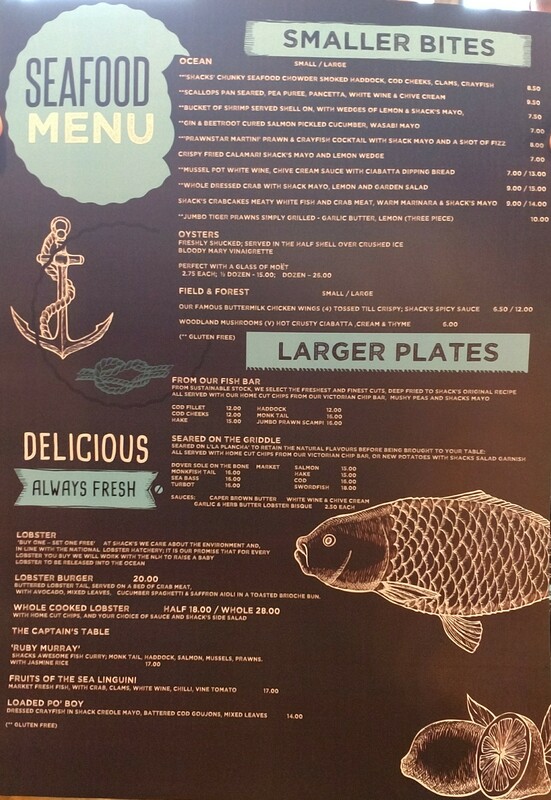 In Cardiff’s defence there are a few place that also do fish. Asador 44 for example, ery good in that respect. As for mackerel – love the stuff esp when super fresh just out of the sea/ off the boat. Crying shame not on menu at this place. 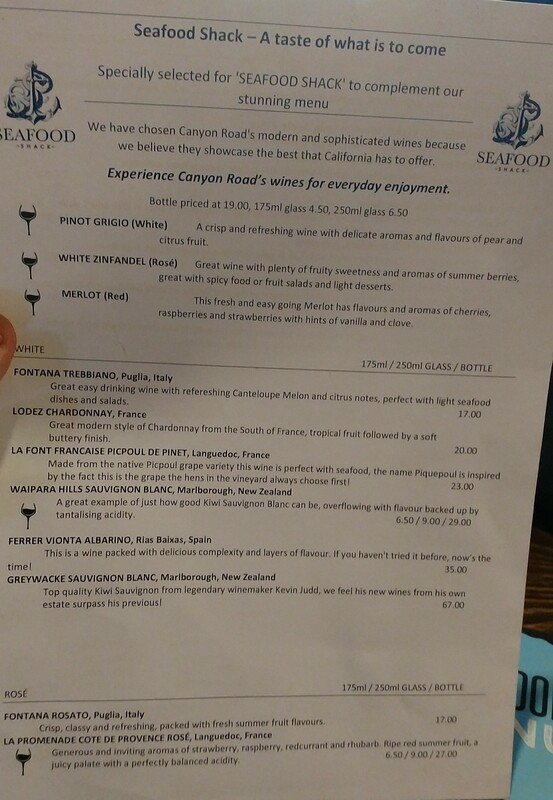 This entry was posted on Jul 9, 2017 by solicitingflavours in albarino, Alcoholic drink, Alternatives to sauvignon blanc, Asador 44, beef, Burger, Cardiff restaurant, cheese, Cornwall, Costco, Curado Bar, curry, Drink, Dry white wine, fish, Fish & chips, Fish at 85, Five Guys, Food, Food and wine products, France, French wine, Galcian white wine, Kota, lobster, Lunch, lunchtime, New restaurant Cardiff, New Zealand wine, Non alcoholic drink, restaurant review, review, Rioja, Rosé, seafood, Seafood Shack, Spain, Spanish wine, steak, Take away, Uncategorized.